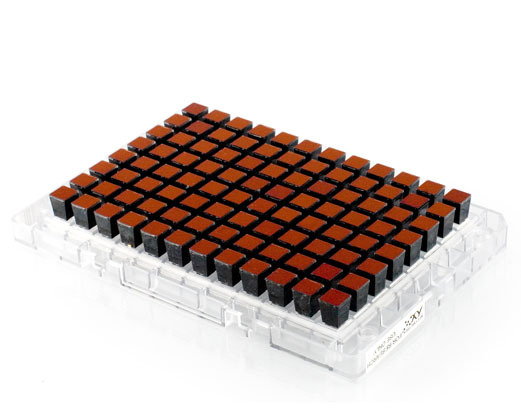 Affymetrix GeneChips™ are the most extensively used microarrays for gene expression profiling. Each transcript is probed with multiple 25-mer oligonucleotides to obtain precise and reliable quantitative data. The GeneChip™ family of arrays covers the broadest range of organisms commercially available, including prokaryotes, agriculturally important crops, animals, and all laboratory model organisms. Different array architectures are available that capture specific features of mRNA molecules (3-arrays, gene arrays and exon arrays). Genomic DNA is cut with restriction enzymes and ligated to adapters. A generic primer that recognizes the adapter sequence is used to selectively amplify fragments within a certain size range, thereby reducing the complexity of the genome. The amplified DNA is fragmented, labeled, and hybridized to the array. Advantages of the Mapping Assay technology are the very high number of SNPs which can be interrogated simultaneously (6.0 with >900,000 SNPs), the low amount of genomic DNA needed (250 ng), high call rates (>99%), and high accuracy.